Google is releasing monthly security patches to the Android Open Source Project that fix some issues and patch up potential vulnerabilities to the system. We've spotted a few hints online the corresponding updates should be almost upon us and indeed. Sprint mentions that the latest software version for the Nexus 5 is MMB29S, released January 4th (ie today). Verizon has the same build on its update page for the Nexus 6, build MMB29O for the Nexus 7 and Build For Android One Devices MMB29O. Both are based on Android 6.0.1 so don't expect a lot of significant changes in these versions. 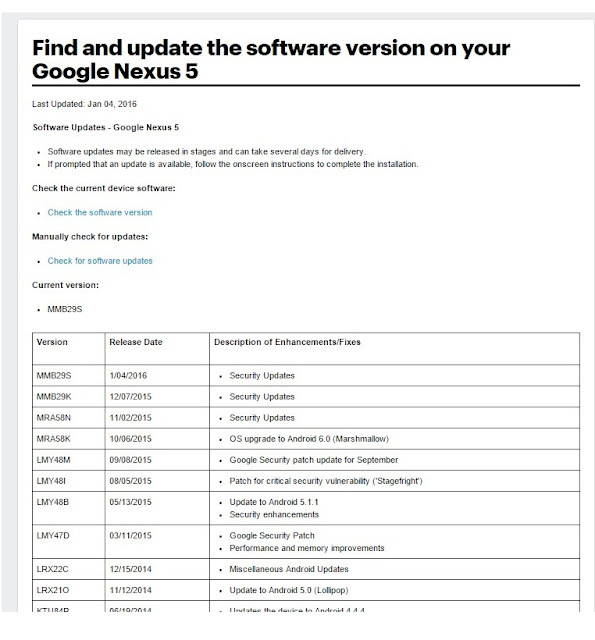 It's possible that other Nexus variants will have a couple of different build numbers somewhere in the alphabetical middle between O and S.
The factory images aren't live yet, but based on Sprint's date for the release, we expect these builds to start rolling out today, Monday January 4th. We'll let you know when the factory images, OTA updates, AOSP source code, and monthly security bulletin start making an appearance and we'll know more about the changes by then.